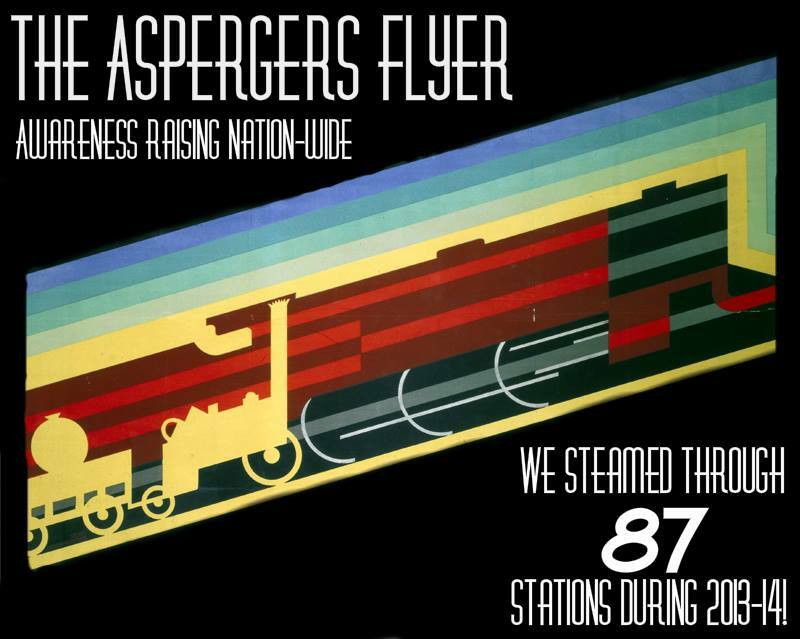 It has been a while since I covered the Asperger’s Fundraiser, due to work commitments, but I can now give you a round-up of what has been happening over the last few months, and what is to come for the remainder of the year. 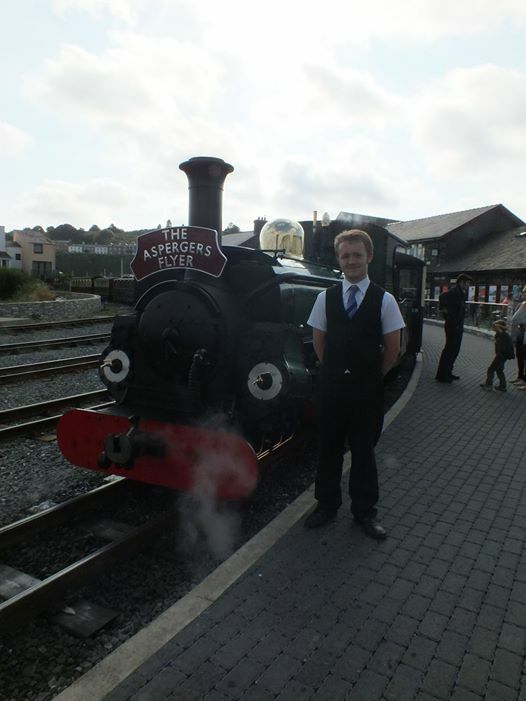 On the 30th July, the Flyer visited two railways as part of its’ Welsh Week’, starting with the Llangollen Railway, and then later on in the day, the Ffestiniog and Welsh Highlands Railway. 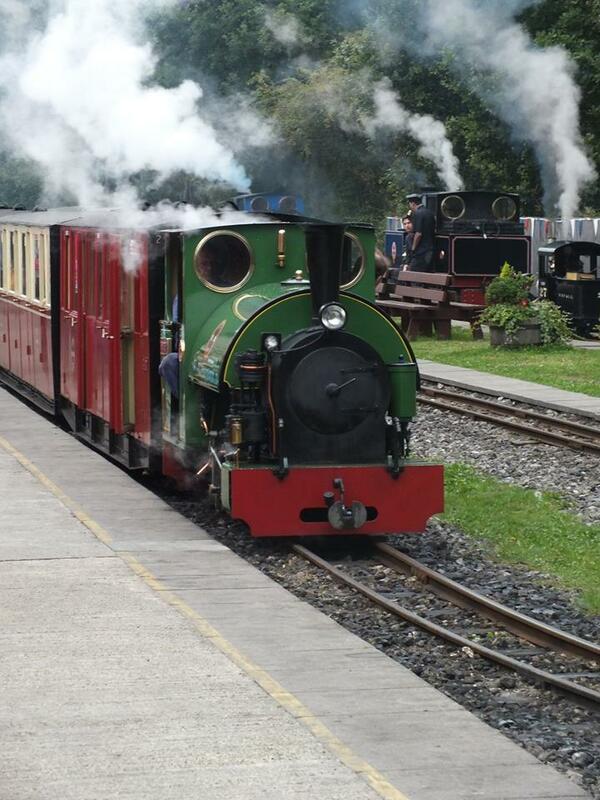 From the pictures below, the locomotives look smart with the Flyer’s headboard! 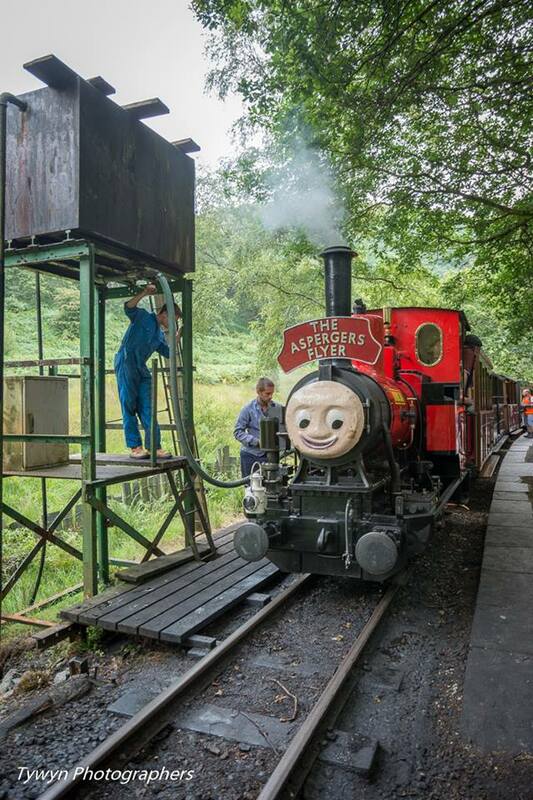 Straight after that, the Flyer visited the world’s first preserved railway, the Talyllyn, on the 31st July, traversing the whole line, behind Edward, Thomas Dolgogh and Duncan. 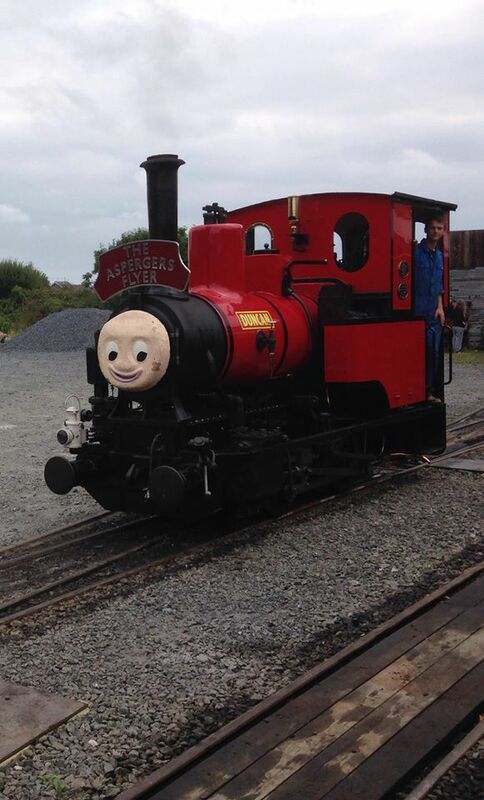 Always time for a selfie, or is that a Talyllyn Selfie! 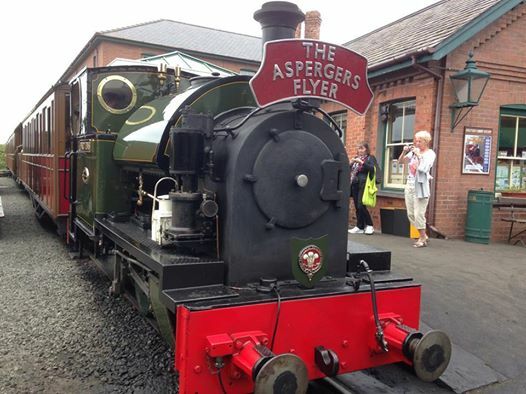 Also, during Steam & Scones, a revolutionary partnership between the Talyllyn Railway and The Aspergers Flyer was launched. 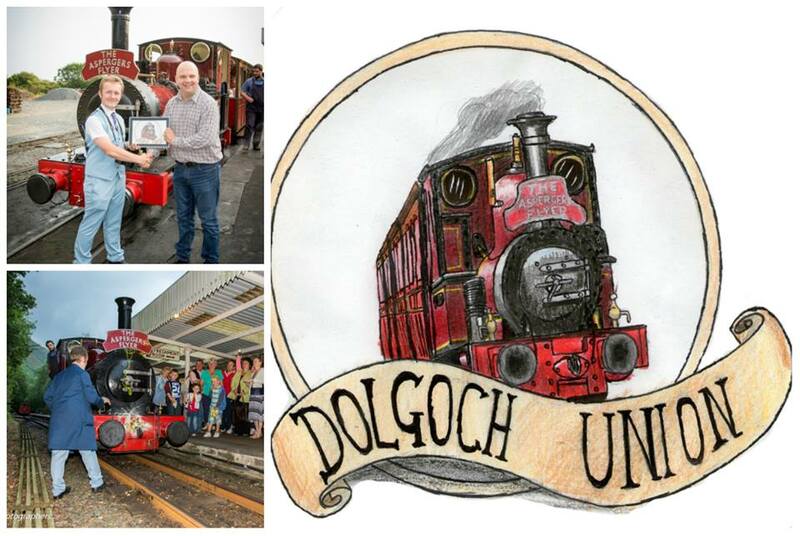 The Dolgoch Union is a commitment on the railway’s behalf to working with the Flyer and it came into being when chairman, Oliver, smashed a bottle of the TR’s real ale on Dolgoch’s front. 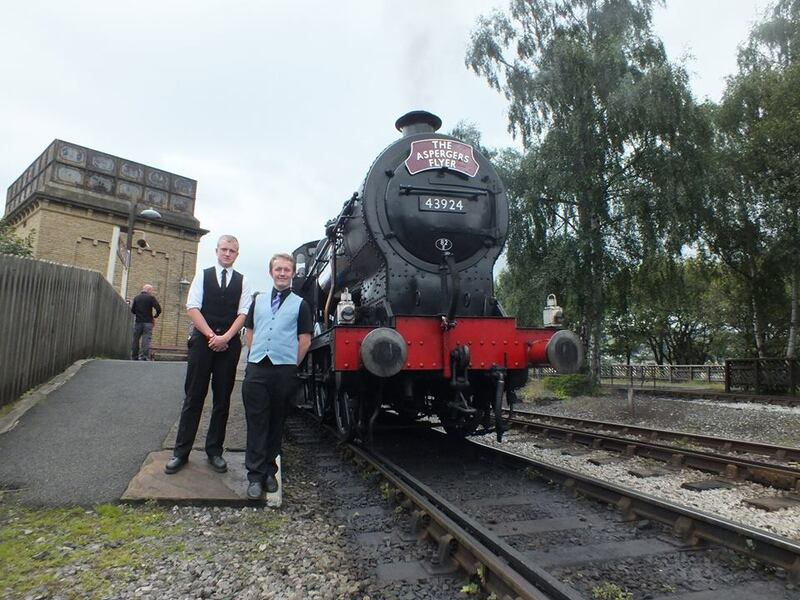 The crest for the Union was done by Joe Fitzjohn, an up and coming artist on the spectrum, and member of the Nene Valley Railway Small Loco Group. A huge thanks to Joe for the crest! 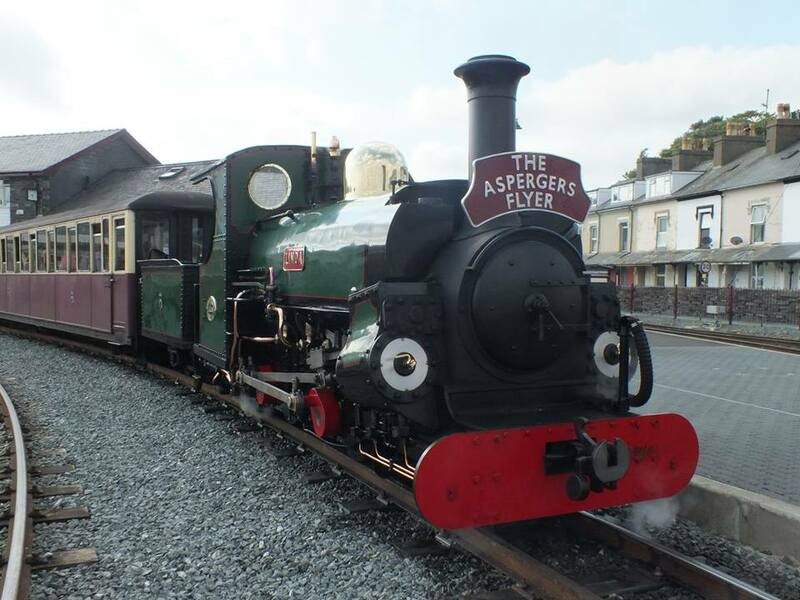 A couple more thanks are in order, especially to Tywyn Photographers for their help with setting up the event and photographing all aspects, which as you can see in this update, have been fantastic! 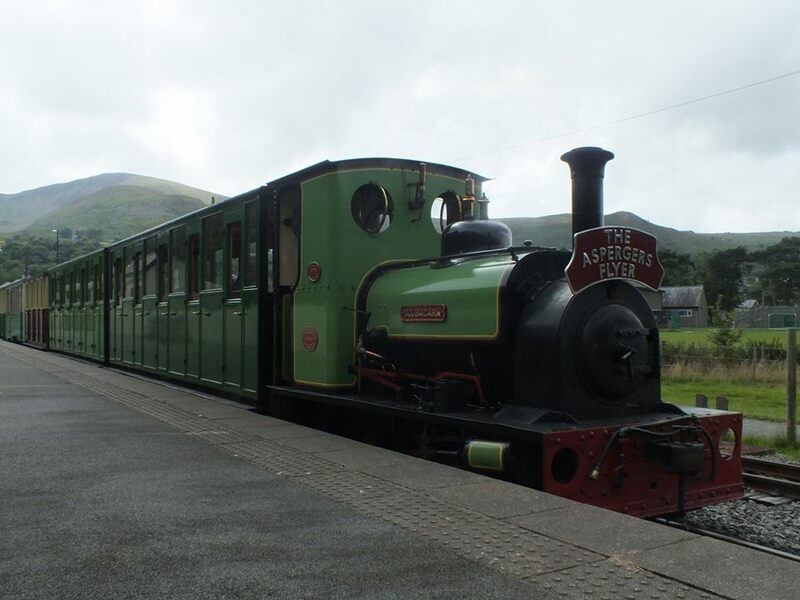 Then, on the 2nd August, the Flyer took the reins of the Llanberis Lake Railway, which has some of the most spectacular scenery in Wales, with the lie being surrounded by beautiful lakes and mountains. 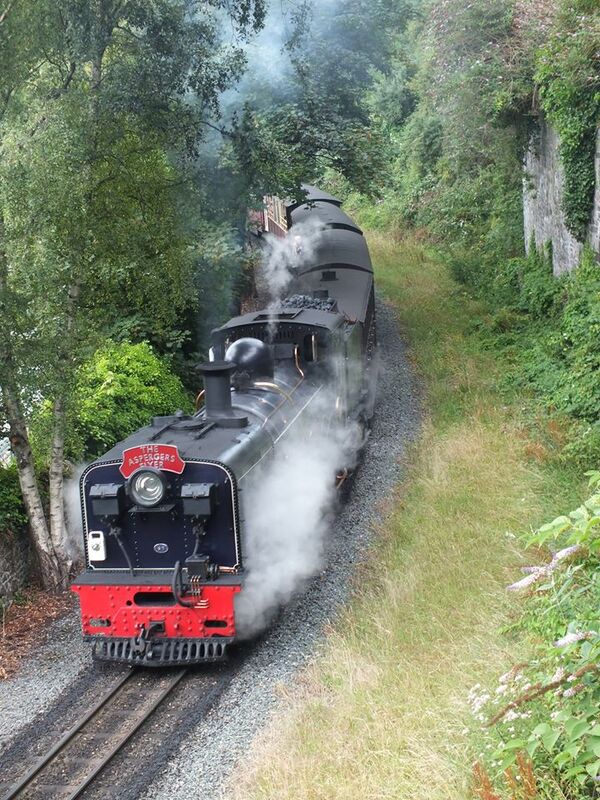 This was quite a picturesque ending to the ‘Welsh Week’. 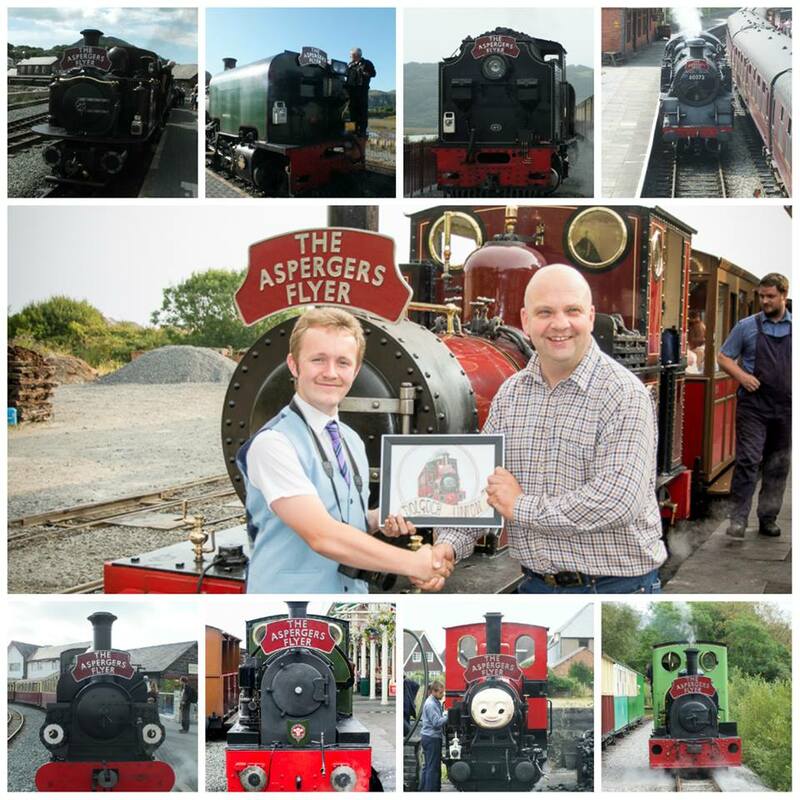 Below is a collage of all nine locomotives that pulled the Asperger’s Flyer during ‘Welsh Week’, which amounted to 273 miles in 5 days! 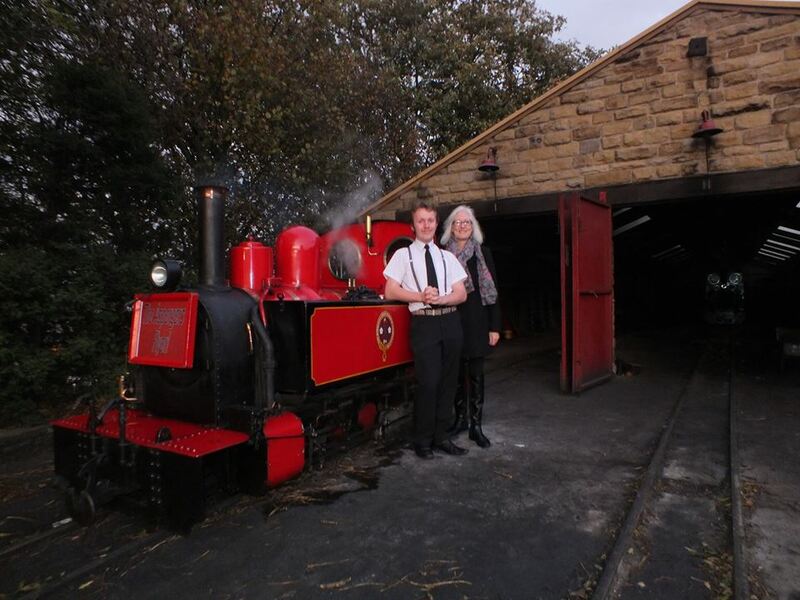 On the 7th August, they returned to the Kirklees Light Railway, when the members of the Wakefield Railway Modellers Society also rode with the Flyer, being hauled by Badger and Hawk. It was also during August that the Flyer was in discussions with the prospect to return during 2015! More on that as the news develops! 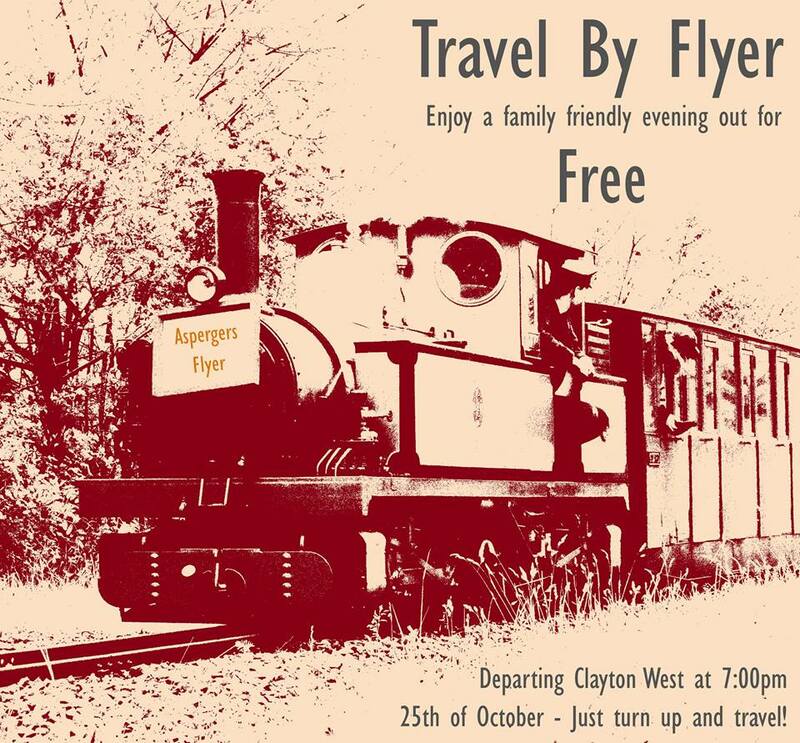 It was also quite appropriate that this was around the one year anniversary of the Flyer, and what a way to celebrate a fantastic year it had been already. A cake was donated by Mulberry Cake Design to celebrate this important occasion. Below is the cake, and one of the many pictures of the previous year. 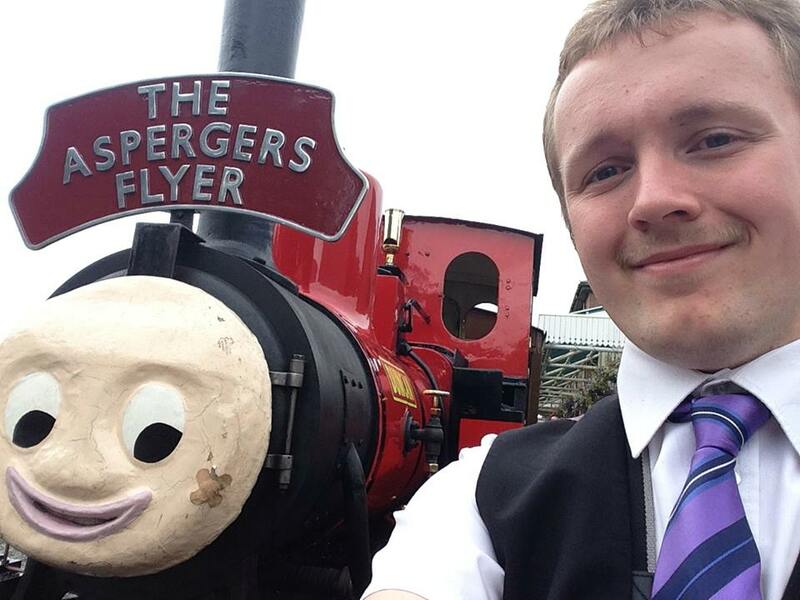 On the 19th August, a day at the Keightly and Worth Valley Railway, the Aspergers’ Fundraiser became ‘Aspergers’ Flyer Educational Society’, with full trustees now securing the Flyer’s future. 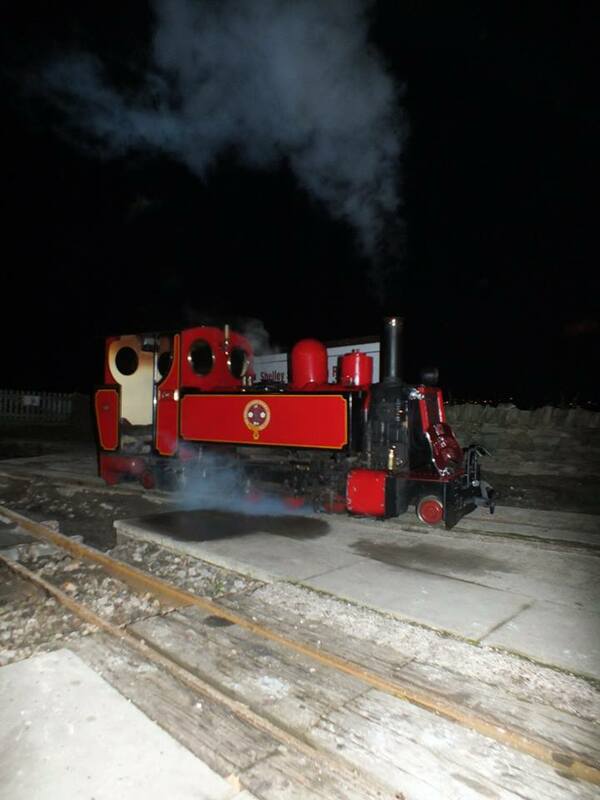 To be fair, the celebrations did not stop there, with the Flyer visiting the Great Central Railway on the 20th August, its’ first visit ever. 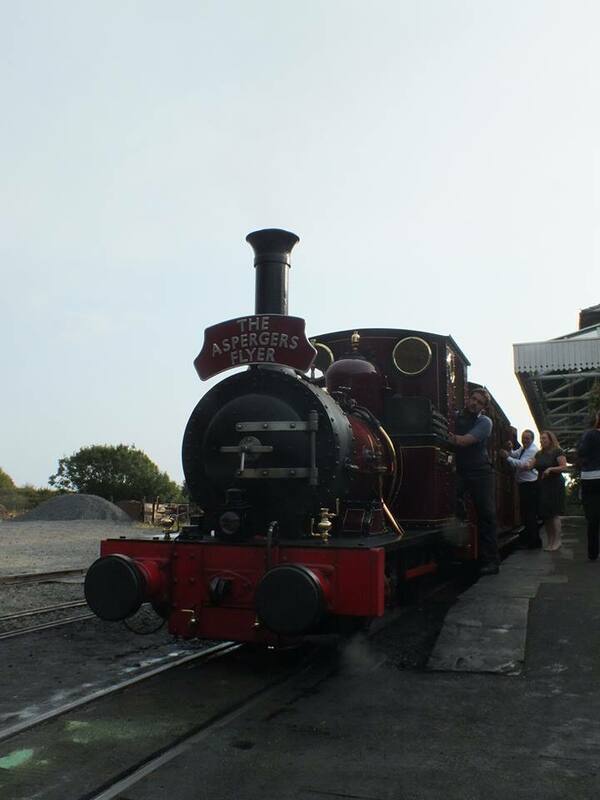 The pictures below shows the Flyer on its inaugural run on the line. 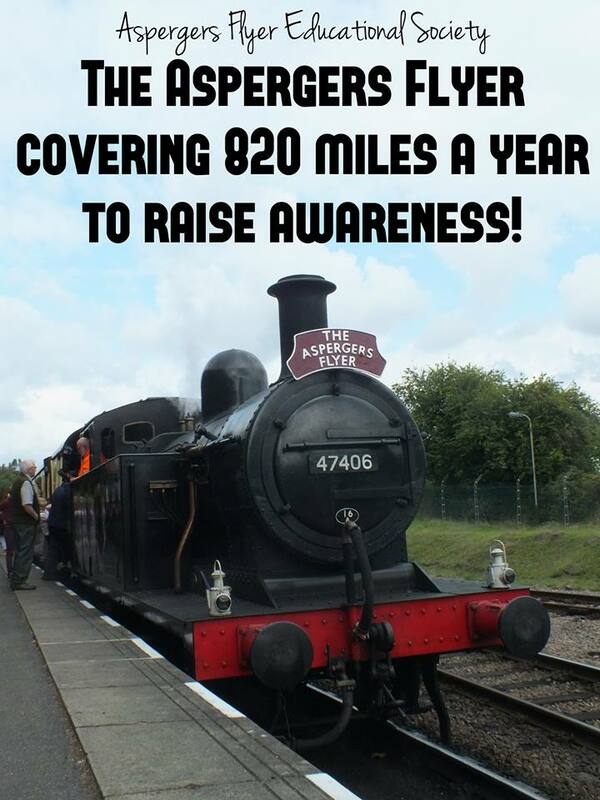 It was also during the day, that the Flyer hit 820 miles in a year. 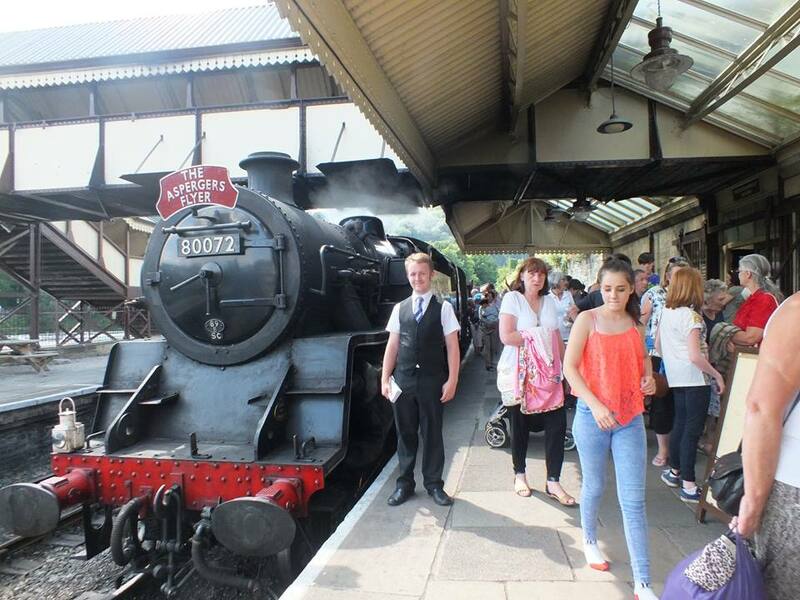 They have also steamed through 87 stations over the previous year, an incredible pair of achievements. 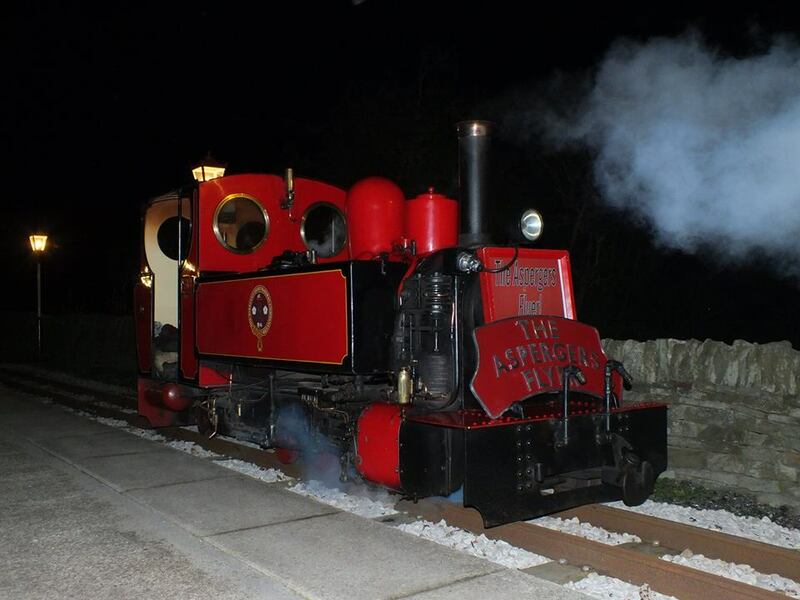 This garnered coverage in the UK Heritage Hub E-magazine, which is excellent coverage for the Flyer! 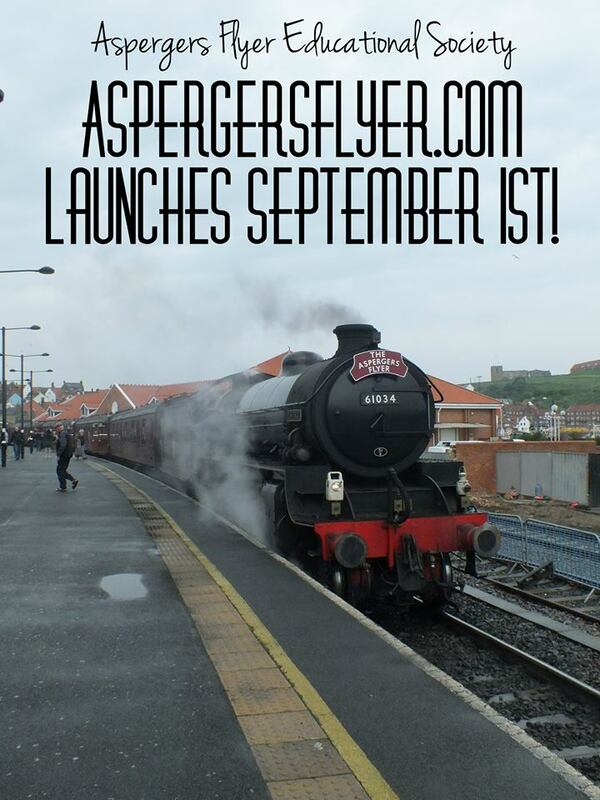 During September, the Aspergers’ Flyer announced a new website, with the expect date of release being the 1st of the month. Unfortunately, this did not come to fruition, but will be available by the end of the year. 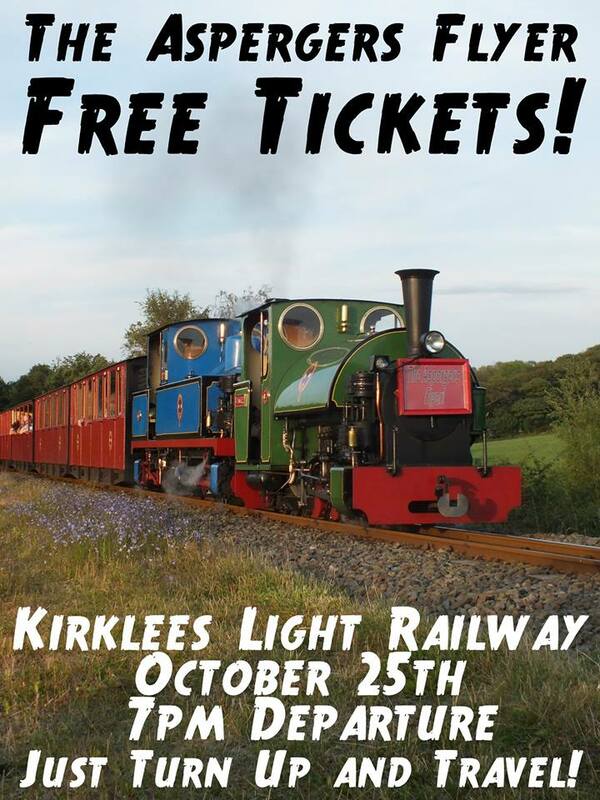 To add salt to the wound, the Keighley and worth Valley Railway could not accommodate the Flyer for their annual Beer and Music festival, but a replacement event would be found. 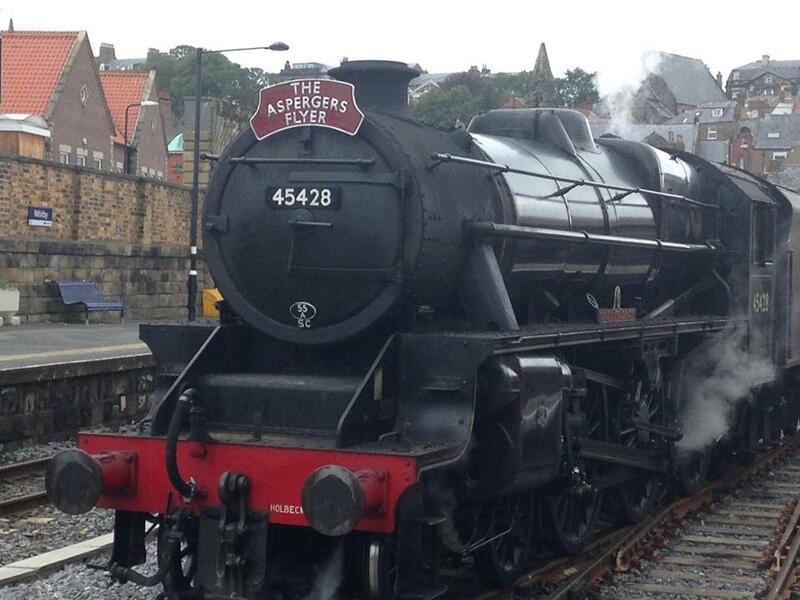 On the 6th September, the Flyer returned to the North Yorkshire Moors Railway, the second time this year, and arrived at the new platform that had been built over the summer. 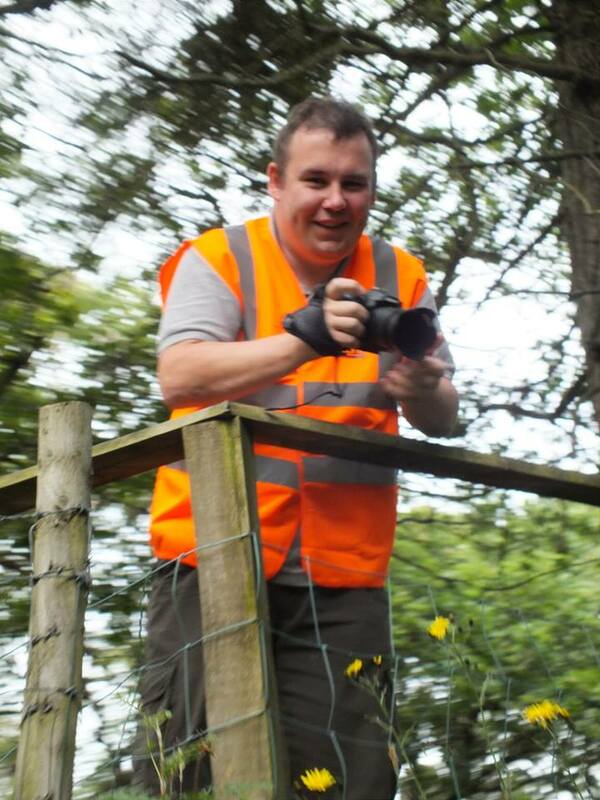 The event raised in total £150, which will all be used in the events next year. 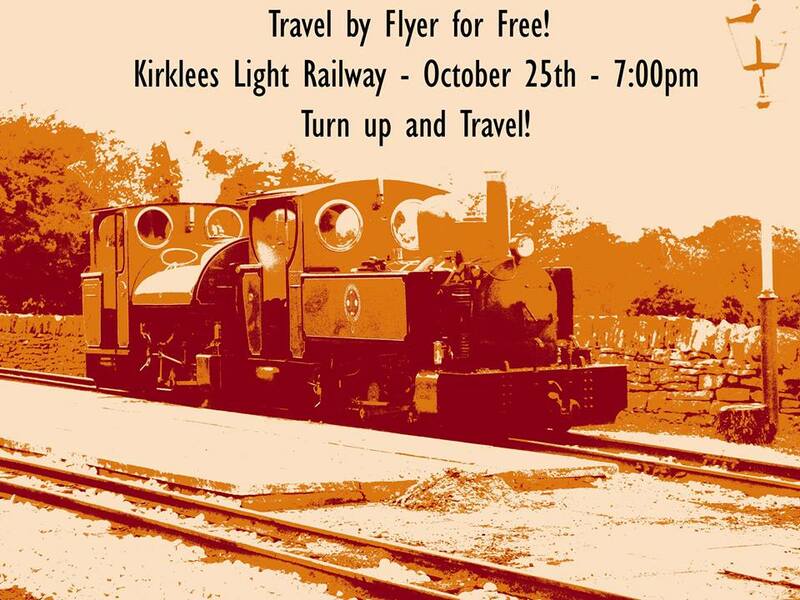 Soon, a replacement for the October event was sourced, another free evening at the Kirklees Light Railway, on the 25th, departing at 7pm. 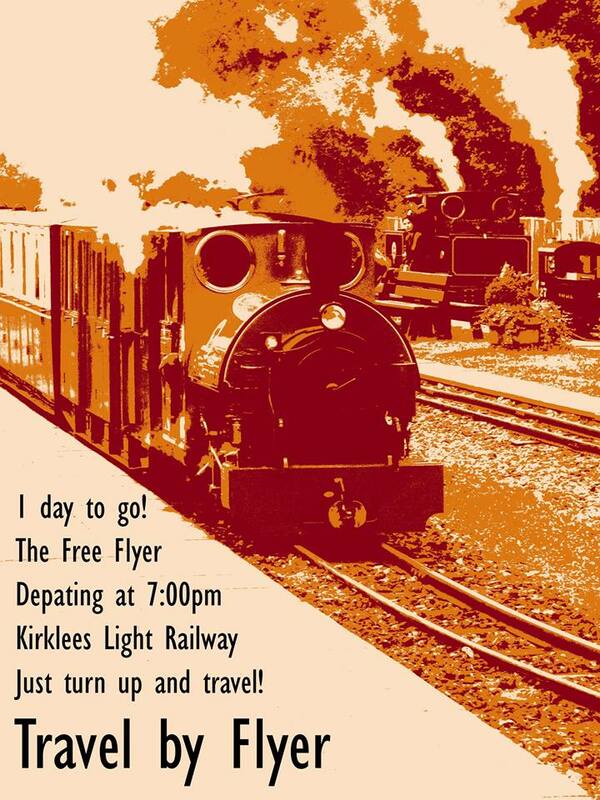 A variety of posters had been drawn up, counting down the days until the event. 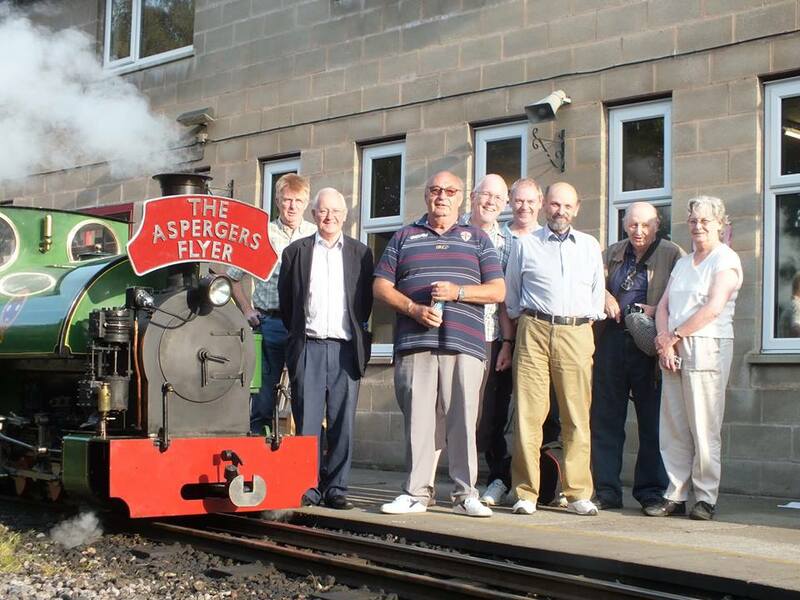 As seen in the pictures below, a great time was had by all and the introduction of Zandra Richards, one of the new trustees that joined the Flyer on the 19th August. 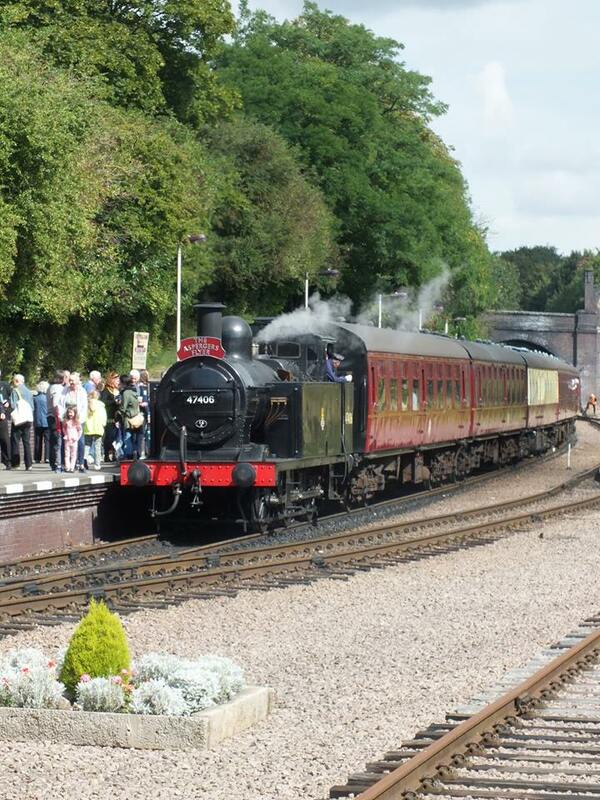 The final events of 2014 will see a return to the Great Central Railway on the 8th November and on the 27 December, which will round the year off nicely. 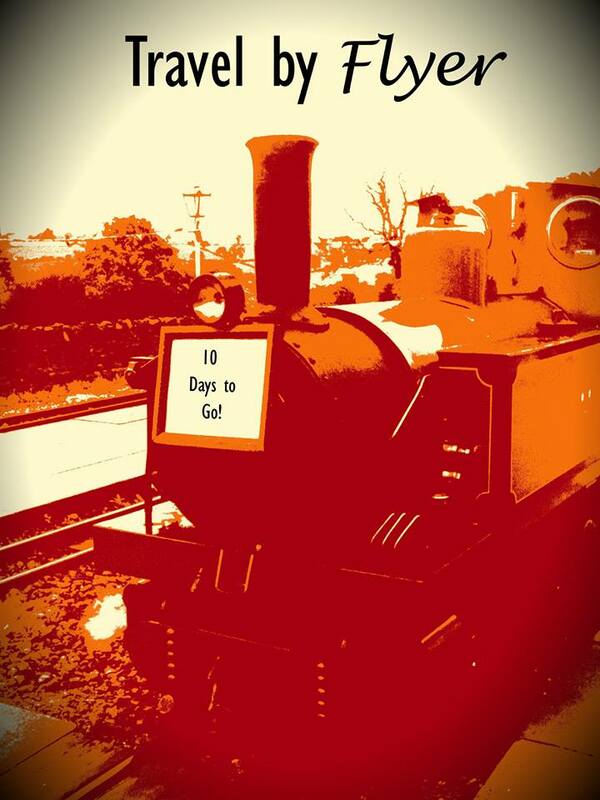 In the future, it is expected that the programme for 2015 will be drawn up, and I will reveal it to all readers closer to the next operating days. 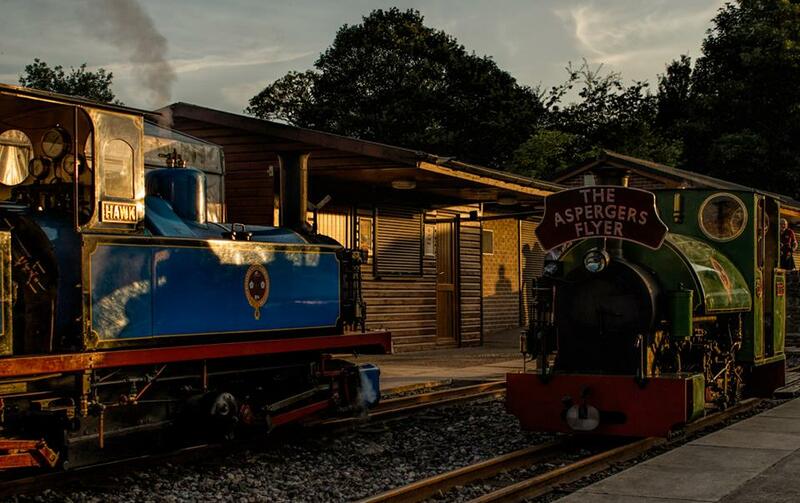 It has been a fantastic year for the Flyer, with me only joining along for the ride in February, but I hope to continue working with the Flyer for all of the Loco Yard readers, and to make sure they have a successful 2015. 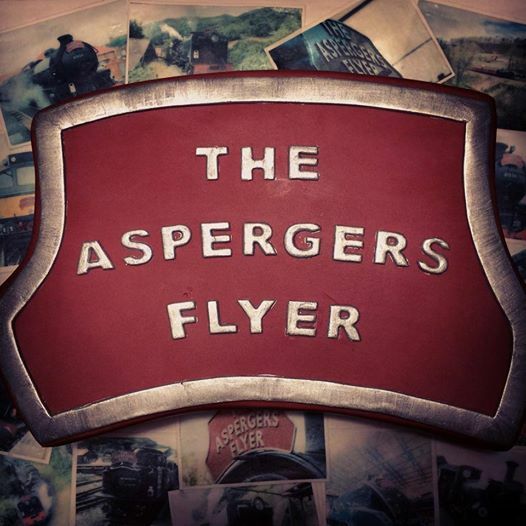 29/10/2014 in 1306mayflower, Asperger's flyer. 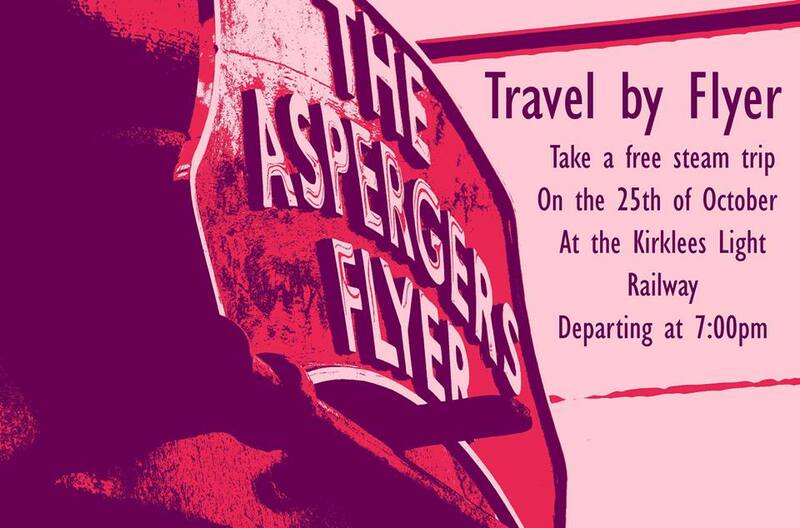 Asperger’s Fundraiser; Going on a Summer Holiday! Hope this helps, and please, do not hesitate to reply if you need more information.